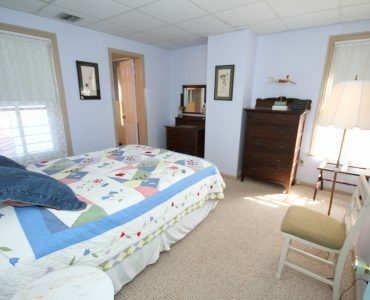 The master suite has a queen bed, two antique dressers, a closet and a full, private tiled bathroom with a tub and shower. 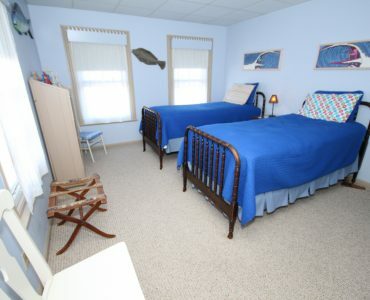 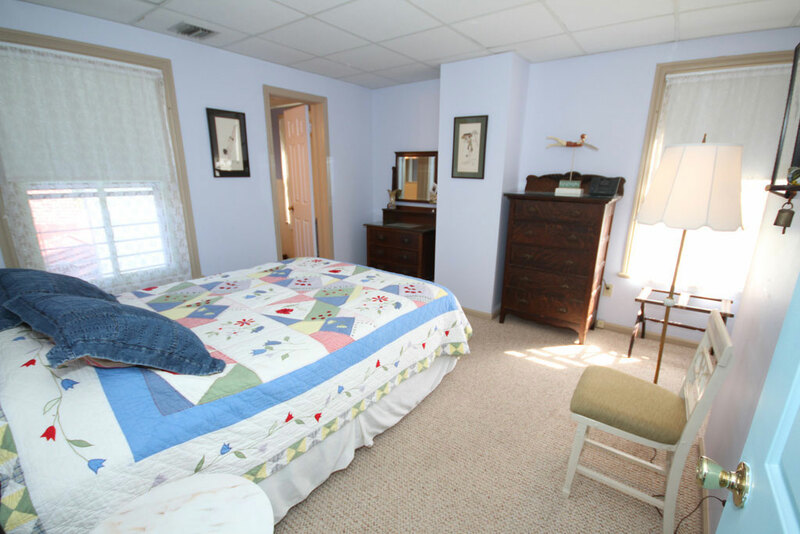 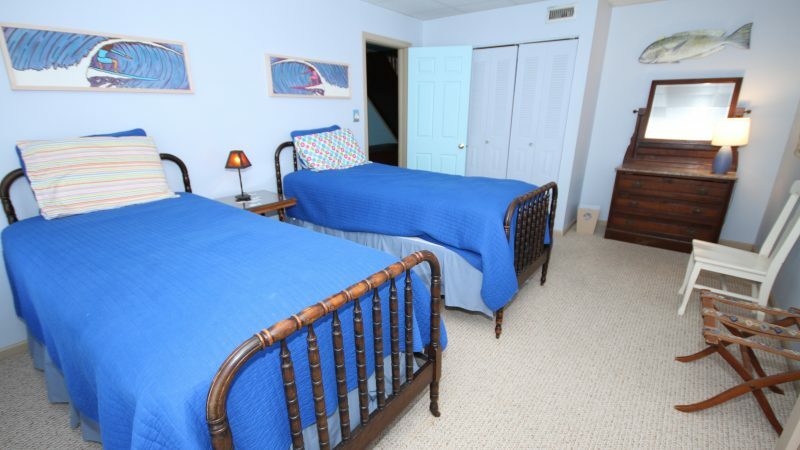 The larger, second bedroom has two over-sized twin beds (will push together as a King bed) and bunk-beds, an antique dresser, and a large closet. 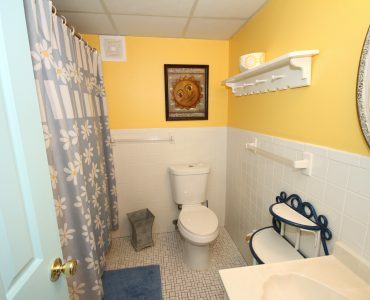 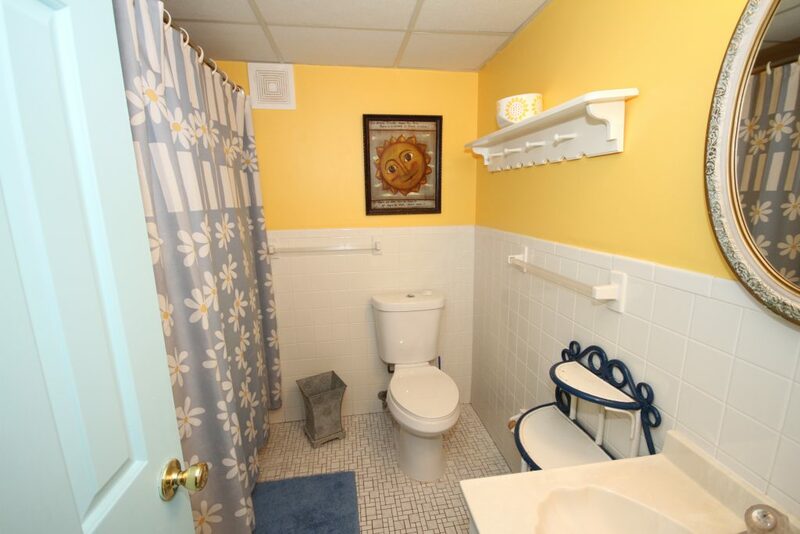 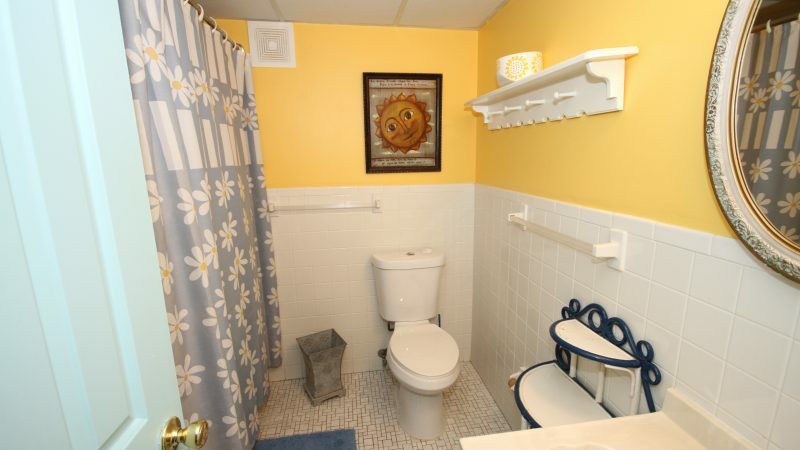 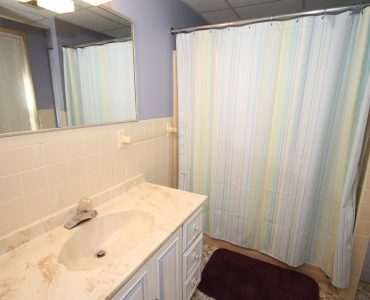 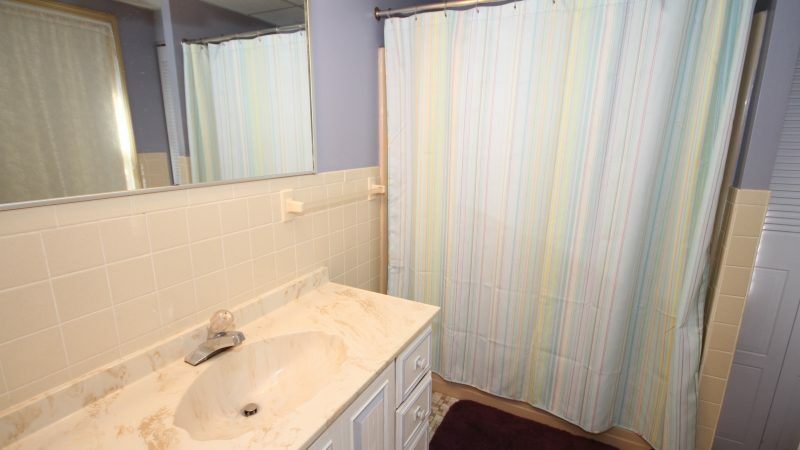 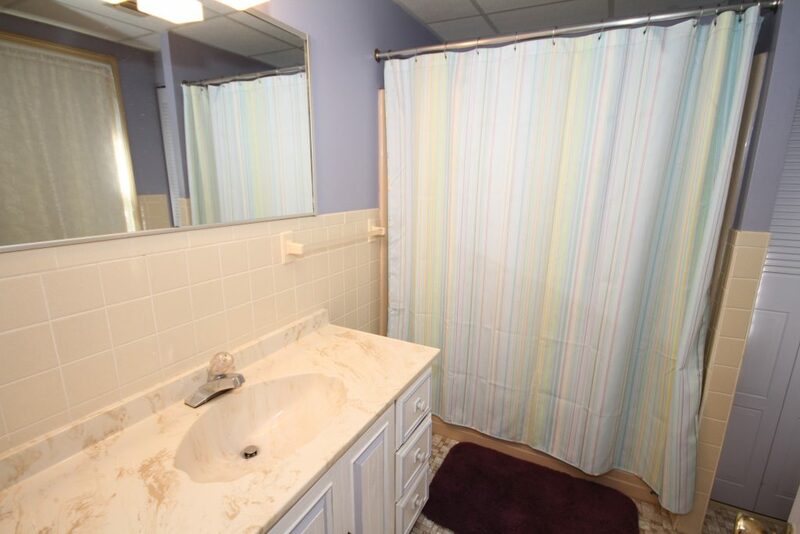 The second full bathroom with tub and shower is steps away. 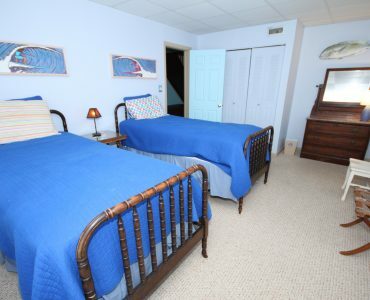 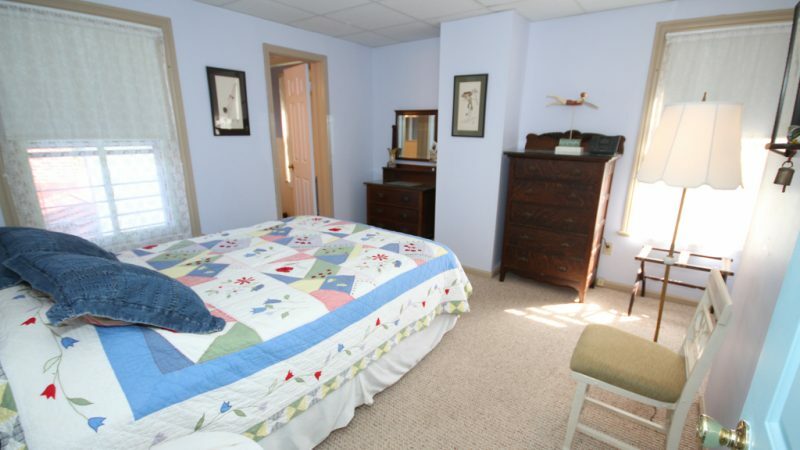 All bed linens are provided with your rental along with maid service after you leave. 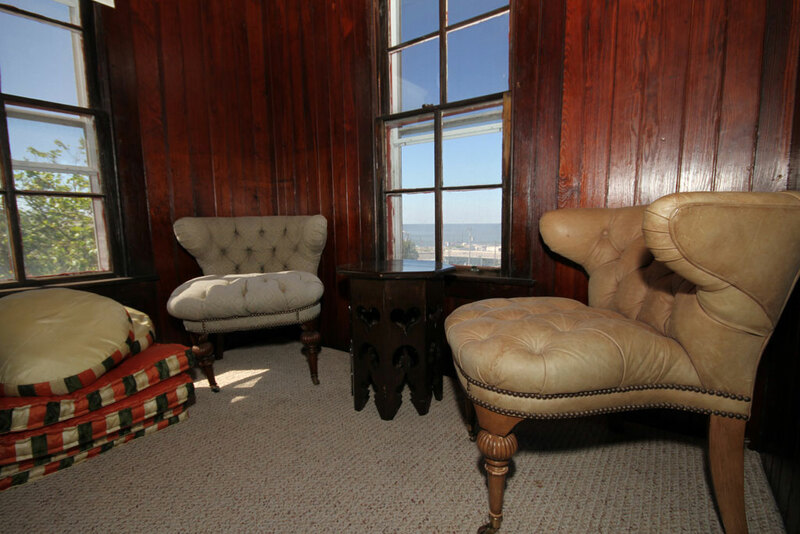 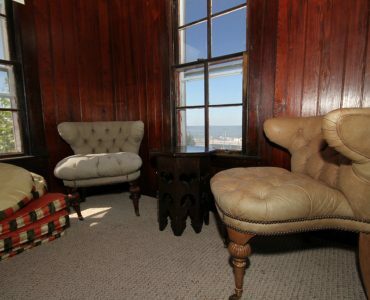 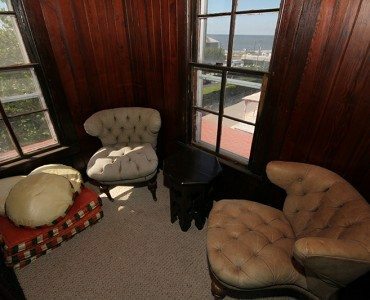 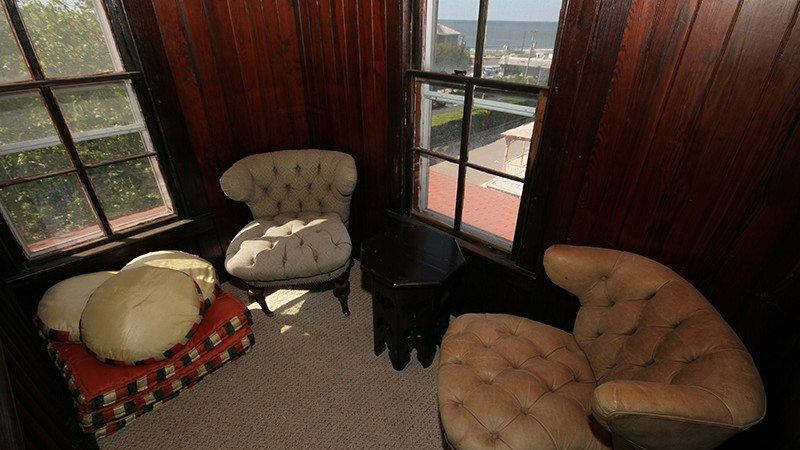 There are 17 windows in our condo to view Cape May in all directions, capture the glorious sunshine and bring you those “cool, cool Cape May” breezes. 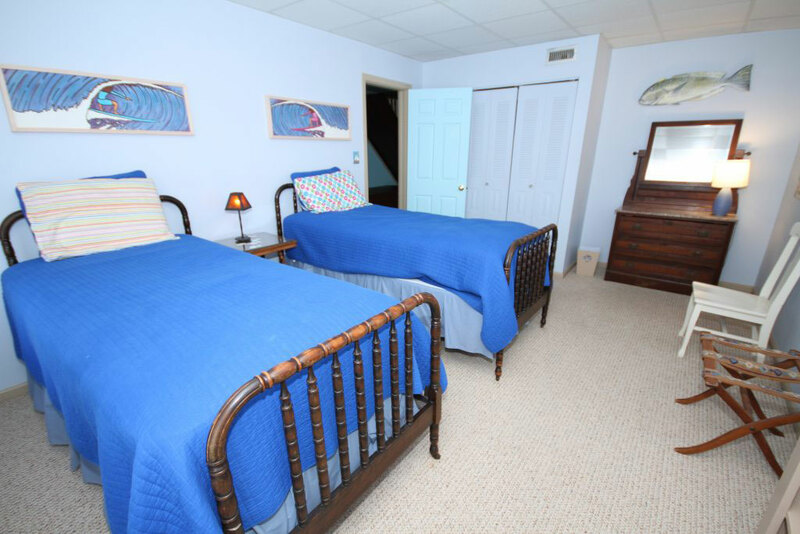 There is central air conditioning and our condo is a smoke-free, pet-free environment. 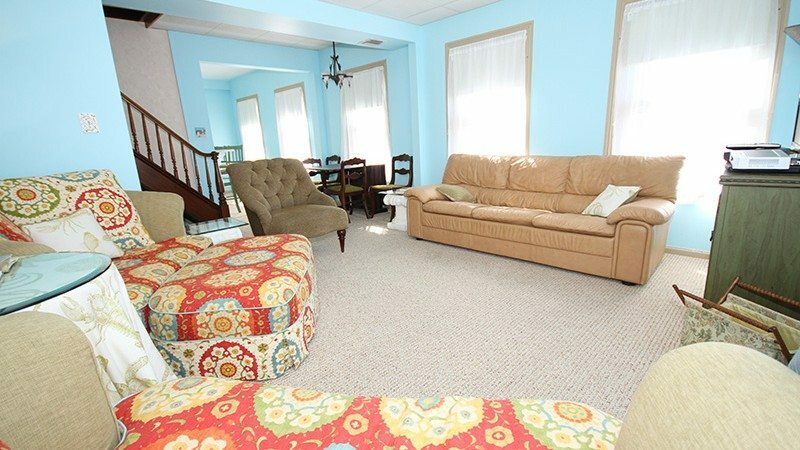 The living room is luxuriously furnished with a Natuzzi leather couch, two matched, overstuffed cuddle chairs with pillows and an ottoman, and a third, upholstered chair. 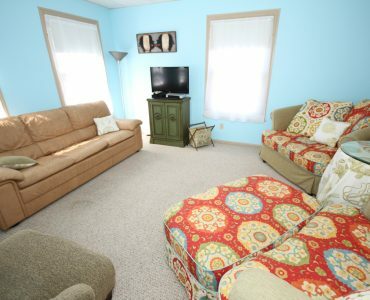 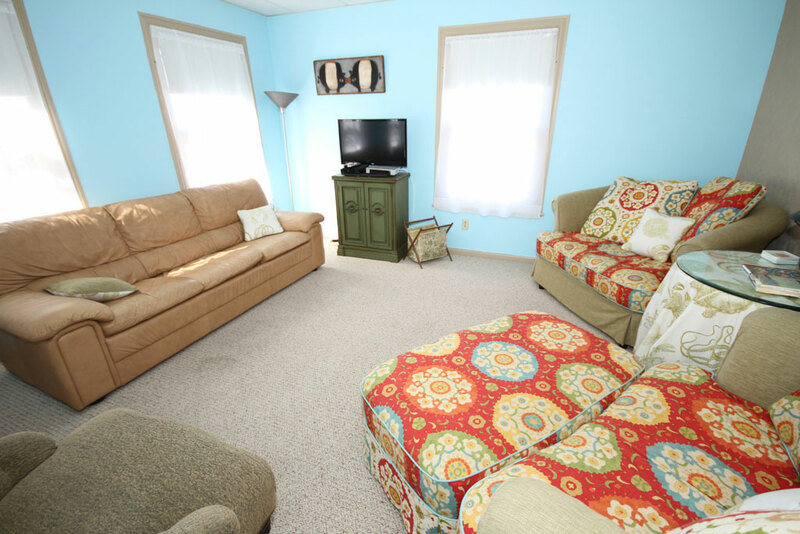 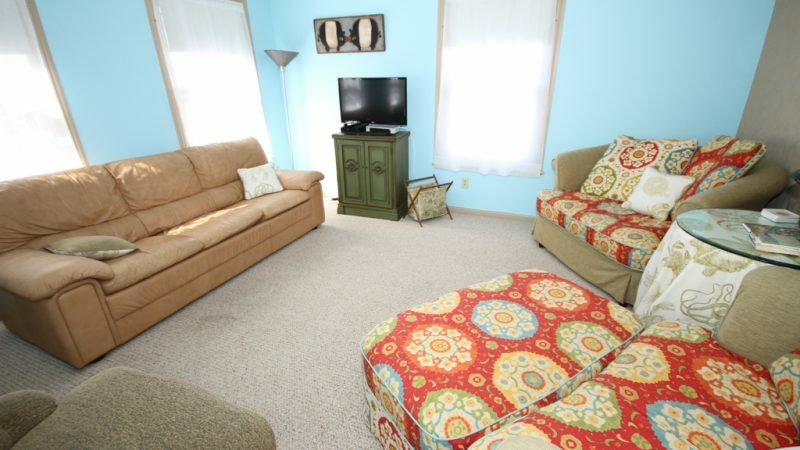 There is a flat screen with Comcast cable TV, wireless internet & phone, and an MP3 docking station. 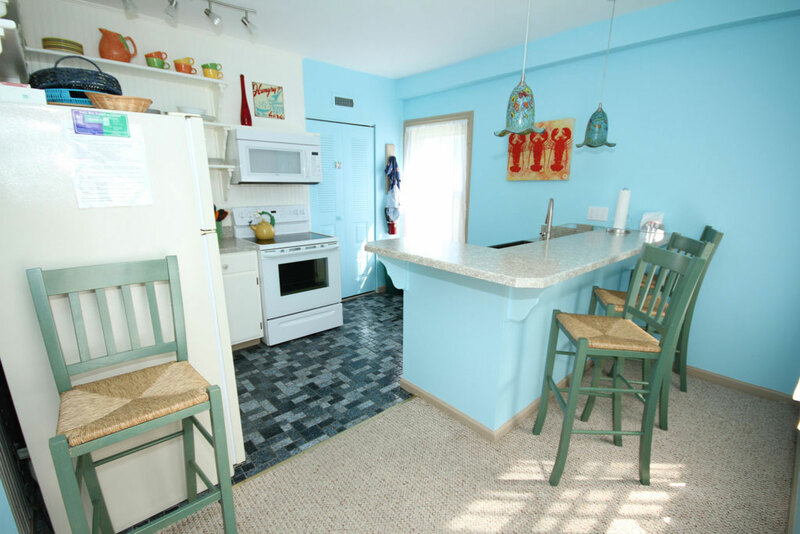 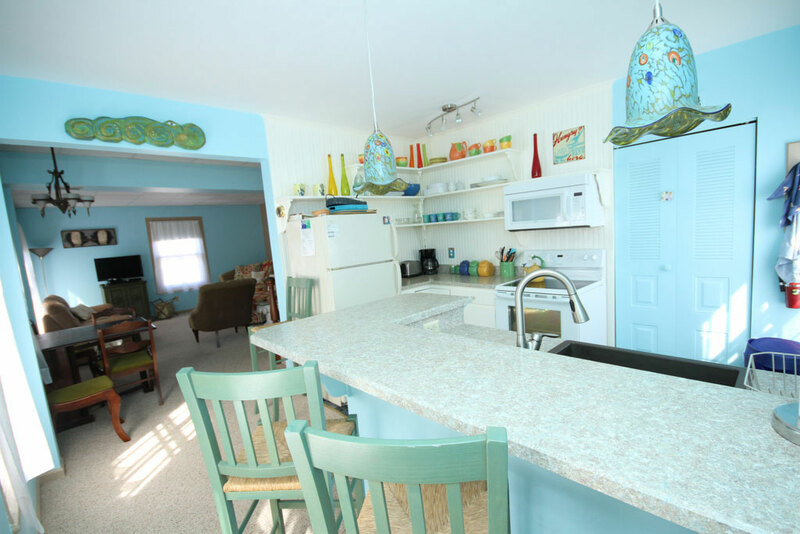 The fully equipped kitchen includes all dishes, glasses, flatware, utensils, pots and pans, refrigerator with icemaker, electric stove, microwave, dishwasher, disposal, coffee maker and toaster. 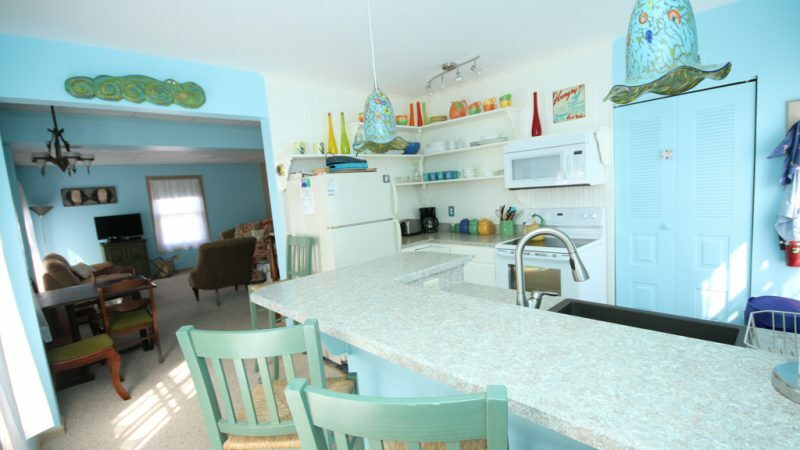 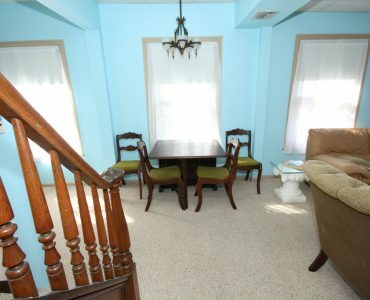 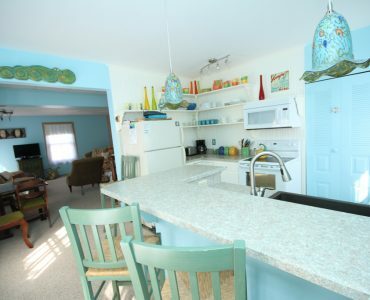 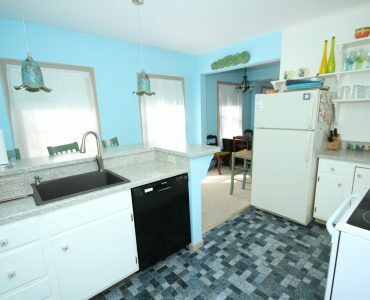 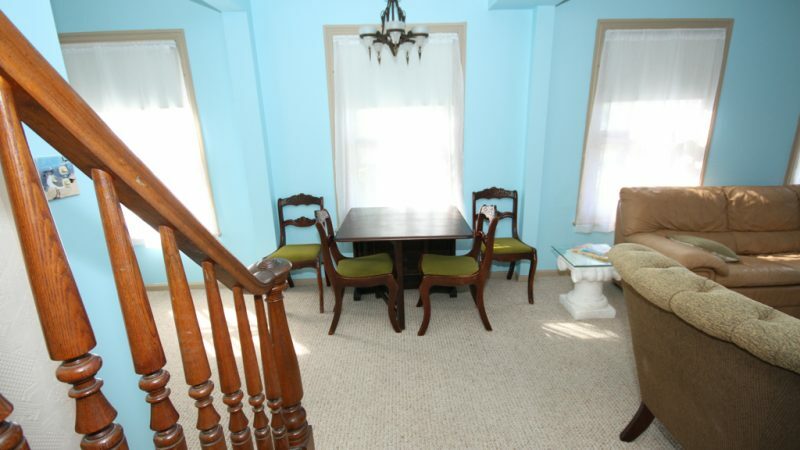 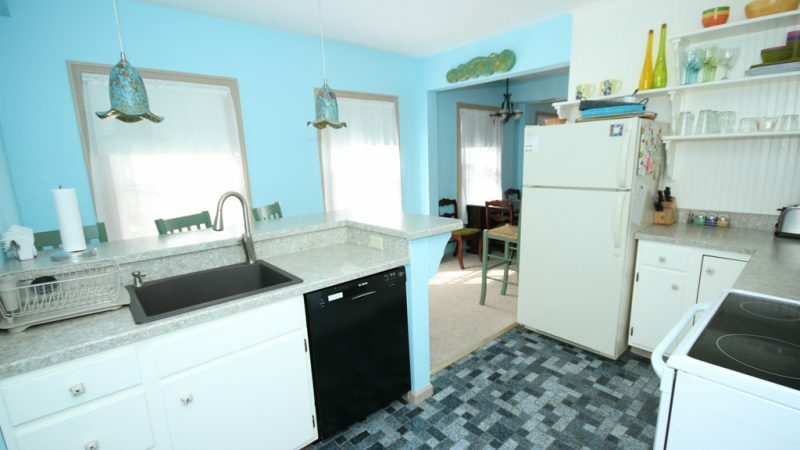 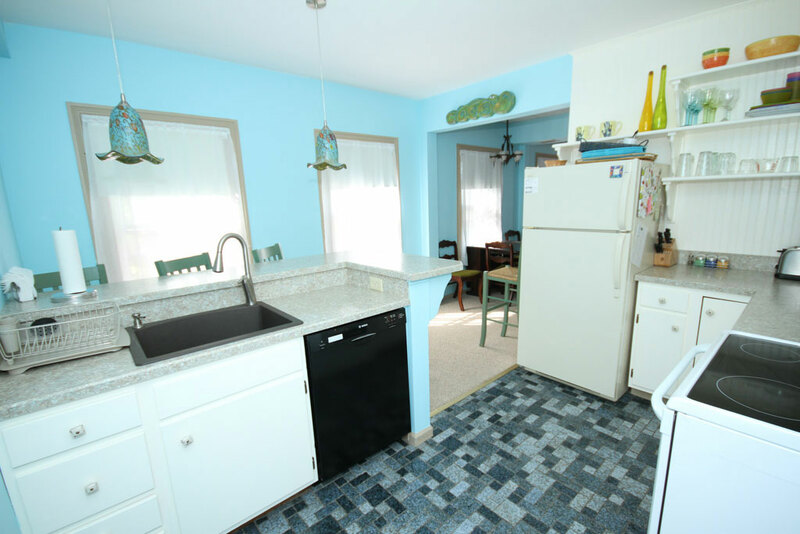 There are four barstools at the island and the dining table is just off the kitchen. 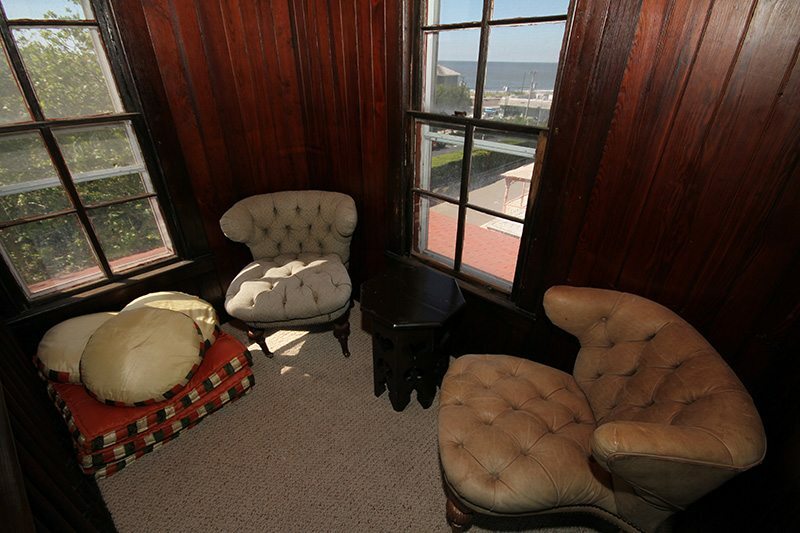 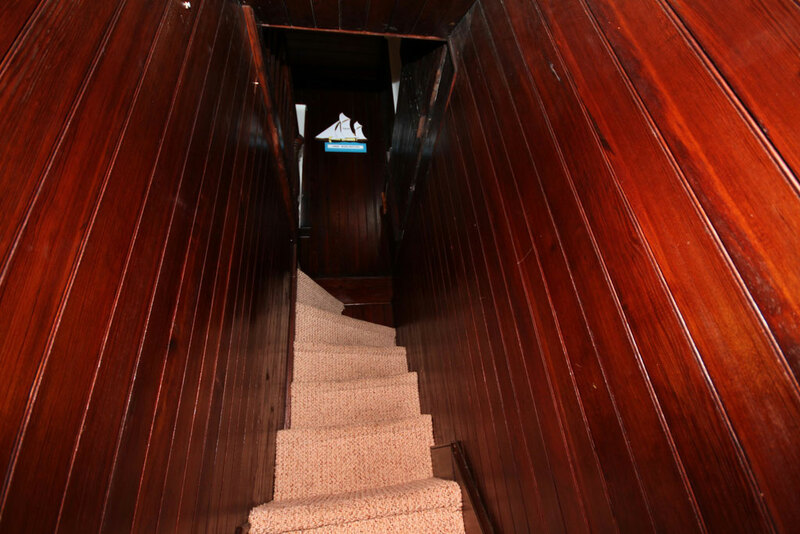 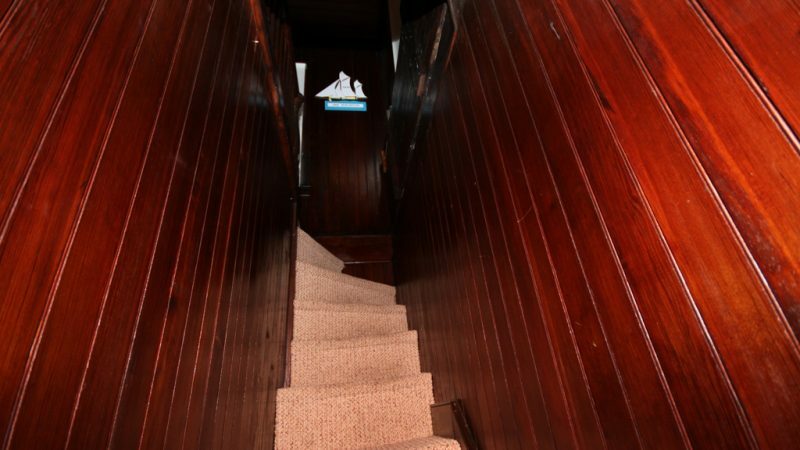 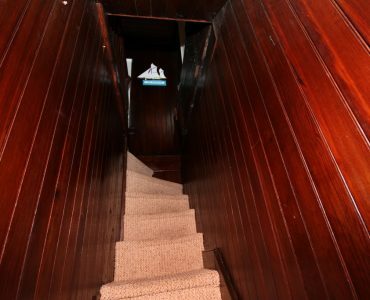 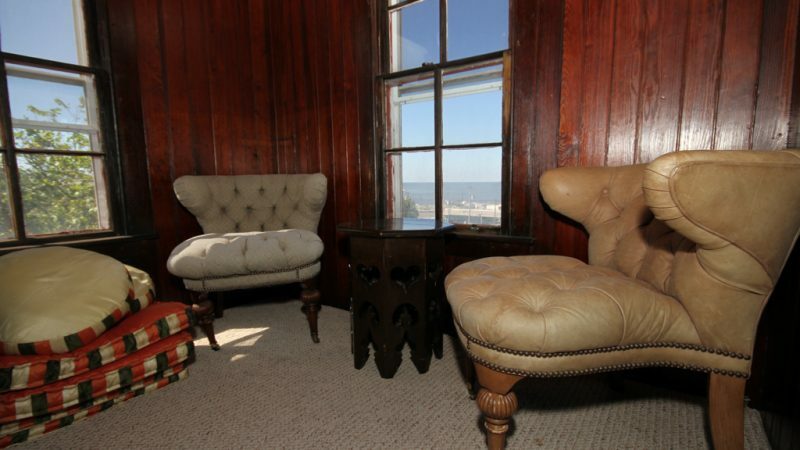 The condo is a short walk to the beach, Congress Hall, and the historic Washington Street Mall. 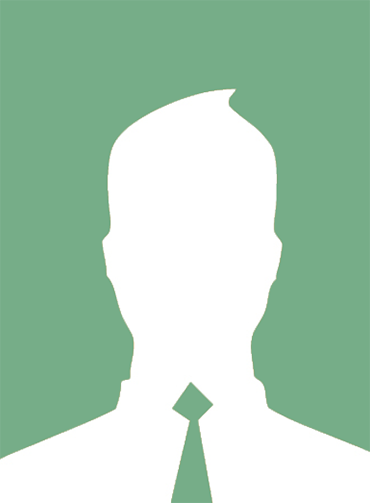 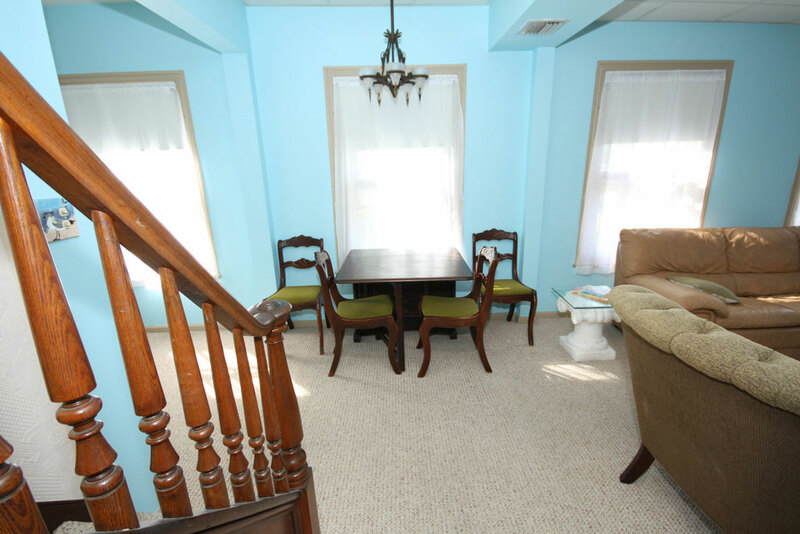 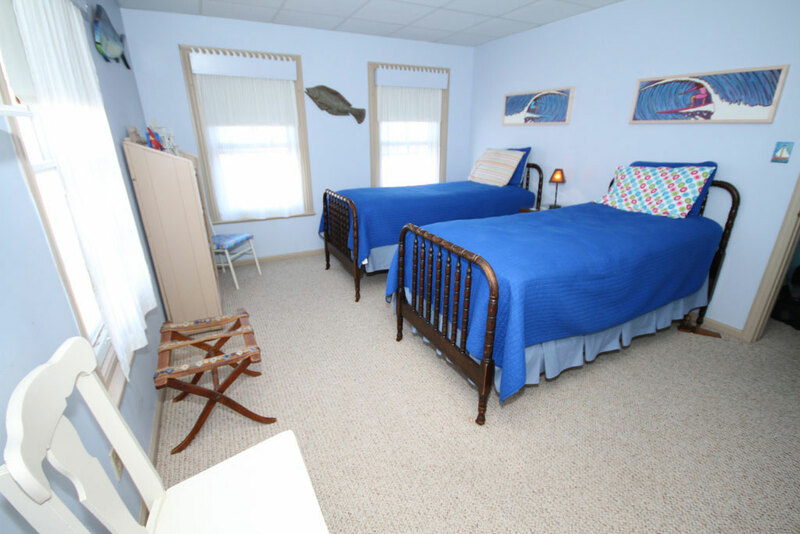 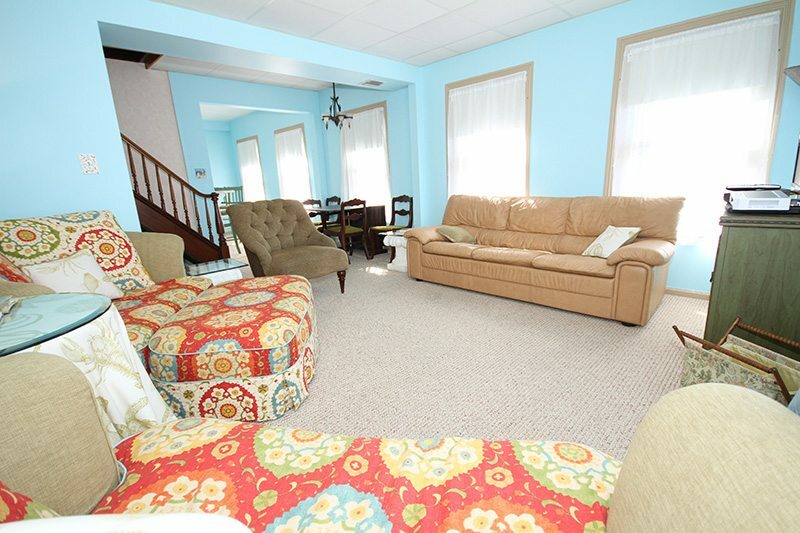 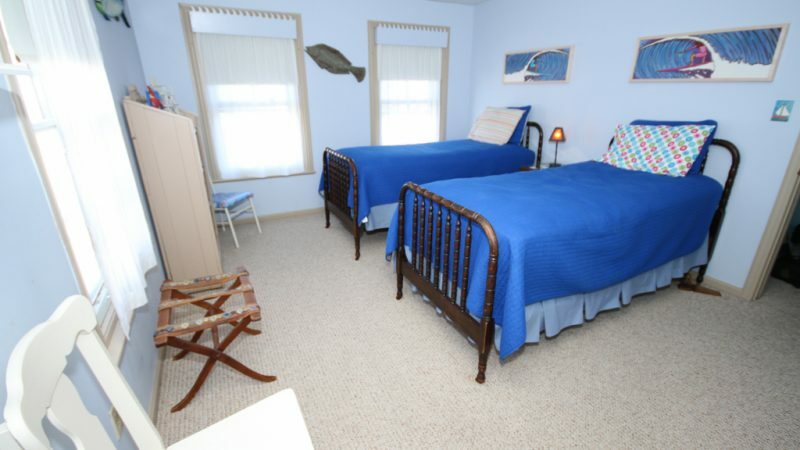 You are within walking distance of nearly all the best Cape May has to offer. 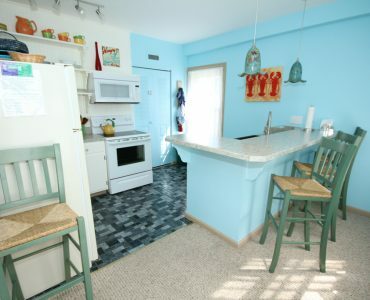 If you have bicycles or rent them in Cape May, we have a bike rack. 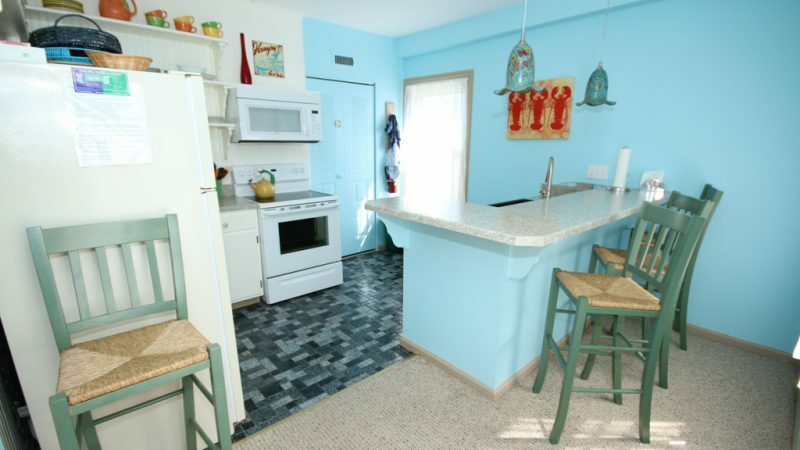 Your rental includes off-street parking, a coin-operated washer/dryer in the building, an outdoor clothesline and access to two, private (enclosed) outdoor showers. 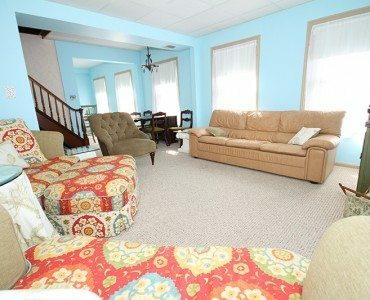 There is free street parking behind our building. 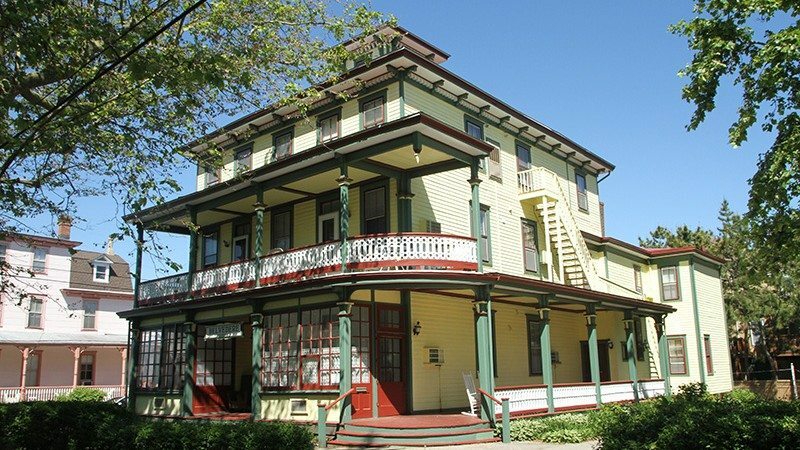 The Belvedere is on a shady, tree-lined street in Cape May’s primary historic district. 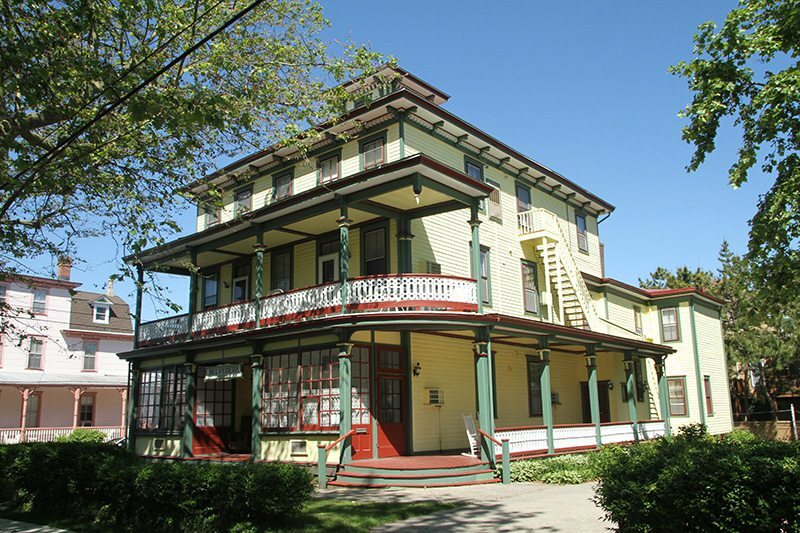 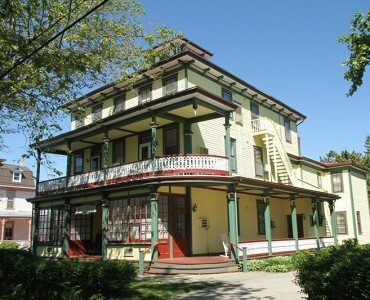 Built in 1870, this Italianate and bracketed-style villa is one of the original and grand, historic Cape May “summer cottages” built by renowned architect Stephen Decatur Button.